Figure 2 is a visually representation of the microbrewing history of Wisconsin. Each circle represented the number of microbreweries in each city as well as the year they were founded. A list of Wisconsin microbreweries are located on each side of the map. Microbreweries are located as far north as Superior, as far west as Hudson, east into the door county peninsula and throughout the south. Microbrewing clusters are evident around Madison, Milwaukee and Green Bay however there is a presence throughout the state. Minhas Craft Brewing Company out of Monroe has the prestige of being called the oldest microbrewery in Wisconsin. Over the years, brewery names and recipes have changed however the passion for brewing local beers has always been a staple virtue in the micro-brewing culture. Historically, there were two periods that heavily influenced growth in Wisconsin's microbreweries. Up until prohibition (1920-1933), only nine breweries existed, all primarily located in the south. After prohibition, it was the large brewers that were able to rebound and quickly find a place in the market once again. The control large brewers had on the market as well as there ability to ship affordable beverages far and wide lead to the dismantling of smaller regional and microbreweries. It wasn't until 1978 when president Jimmy Carter signed the bill H.R. 1337 into law that home brewing was finally considered legal. The bill deregulated the brewing industry and repealed federal restrictions and excise tax on home brewers. After a period of lag time after H.R. 1337 was passed, Wisconsin experienced a boom in local microbreweries, starting with Capital brewing in Middleton, WI (1984). Figure 2. 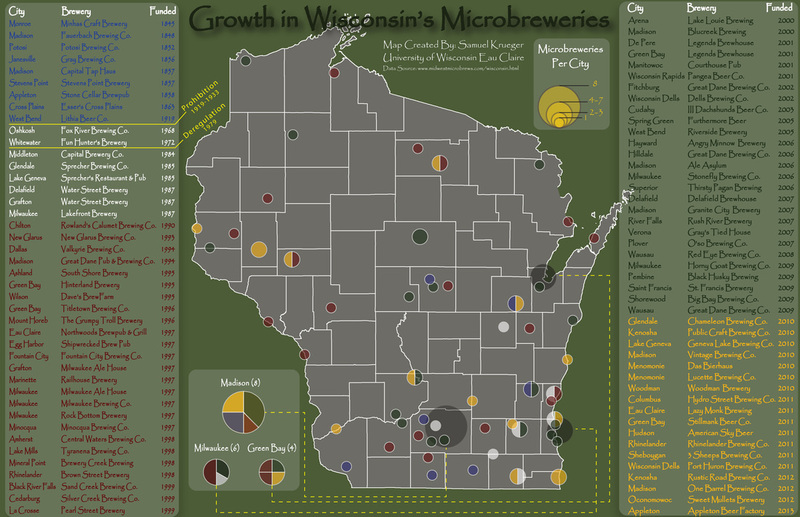 The growth in Wisconsin's microbreweries from 1845 to 2013. Circles symbolize quantity of microbreweries per city and year funded.